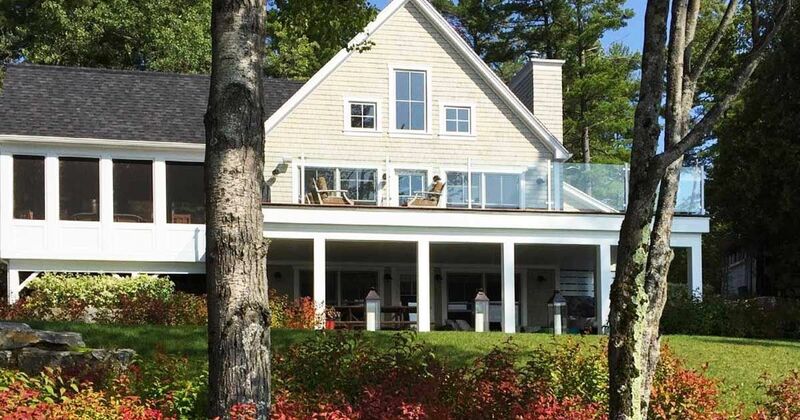 Not everyone can boast the luxury of two residences — a weekday home and a lake home. However, Caroline of the Instagram account Town and Country Style has been truly blessed with this "problem," and her lake house is truly dazzling. It features all of the classic features of cottage design but also easily references that much-loved farmhouse appeal. The public area of the home centers around a rustic black-and-white kitchen. The perimeter of the space features dark lower cabinetry and contrasting white uppers. The black lowers and hardware help to anchor the eye, while the white uppers and shiplap-clad walls accentuate the height of the ceilings. The spacious island features a wood countertop that adds a touch of rustic charm to the space. The "cherry on top" is a wood-and-metal ladder, attached by a railing, that provides easy access to the top row of cabinets. The adjoining living space is made up of the dining room and living room, which both provide impressive views of the tree-lined lake. Here the walls and ceiling are covered in shiplap as well and create a textural opposition to the black, double-hung windows. On the far side of the room, a stone fireplace creates a welcoming ambiance and functional warmth when the weather turns chilly. Slipcovered dining chairs and couches ensure that the homeowners can maintain that crisp, white aesthetic with a simple wash and a little bleach. Each of the bedrooms continues with shiplap walls and a traditional cottage motif. The design is simple and elegant, an approach that allows the home's architecture and the great outdoors to take center stage. This is especially important in the Canadian cottage country, where the summers are warm but the winters can be fierce. A home's design should maximize light and ensure warmth when the weather dips below freezing. The rustic kitchen has been outfitted with Shaker-style cabinetry and contrasting nickel pulls. A combination of closed and open storage keeps the space feeling open and airy. The white farmhouse sink coordinates perfectly with the wooden materials and black accents. The island offers plenty of seating options for family and friends as they flock to the kitchen for a warm meal. A farmhouse table, set on one side of the main room, provides comfortable seating for 12, as well as a beautiful view of the lake. A natural fiber rug anchors the living room space by providing structure for the furniture layout. Warm woods and white bedding keep this master bedroom simple and restful. The black metal bed sits in front of a white paneled wall. Vintage paddles reference the location of the home. Another bedroom, with a few feminine touches, provides a retreat for the homeowner's daughter on visits to the lake house. This lake house represents the best of Canadian cottage country and certainly deserves to be shared, so head on over to Facebook.